Homeowners are increasingly drawn to an exterior style that is popularly known as “contemporary farmhouse”. In some areas, it is overtaking traditional manor homes and replacing the craftsman style that’s been popular for a decade among buyers in close-in suburbs. While “contemporary farmhouse” is not a strictly architectural term, it is easily identified and characterized by its very “clean” appearance, and a few signature elements: stark color contrasts (typically white clapboard siding and dark colored windows), stacked stone accents, steeply pitched roofs in dark colors, gables and dormers to define the roofline, and large, inviting porches. 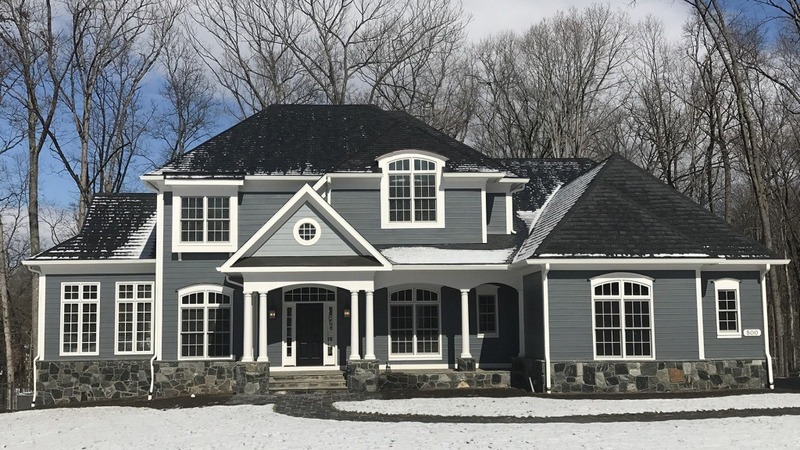 This Gulick | One home incorporated some elements of the Contemporary Farmhouse style, but included hipped roofs and excluded the dark colored windows. While exteriors evoke classic, simple farm homes, interiors lend themselves to a sophisticated mix of traditional, modern, rustic, and even industrial elements. Open-concept spaces and clean lines let homeowners tailor a unique, transitional style that is both comfortable and sleek. Interiors often feature high ceilings (which may be emphasized with exposed beams or rafters), simple, clean-lined trim, rich wide-plank wood floors, large-format tile (typically rectangular), and a neutral color palette. The understated effect provides the perfect backdrop for striking design features, such as an oversized fireplace, sliding barn-style doors, custom metal stair rails, unique lighting fixtures, or distinctive rugs to add pops of color and texture. Contemporary farmhouse kitchens typically feature clean-lined cabinetry, with craftsman style or inset cabinet doors, set off with simple hardware. Quartz countertops with eased edges are predominantly white or muted colors with subtle (or no) patterns. Focal points include metallic or colored mosaic or solid surface backsplashes and oversized farmhouse sinks with aprons. If you’re drawn to the contemporary farmhouse style, talk to your builder about how to incorporate key style elements for your personal preferences and needs. We are currently designing several new floorplans in a contemporary style for an upcoming community in McLean, and can’t wait to share them as they develop!